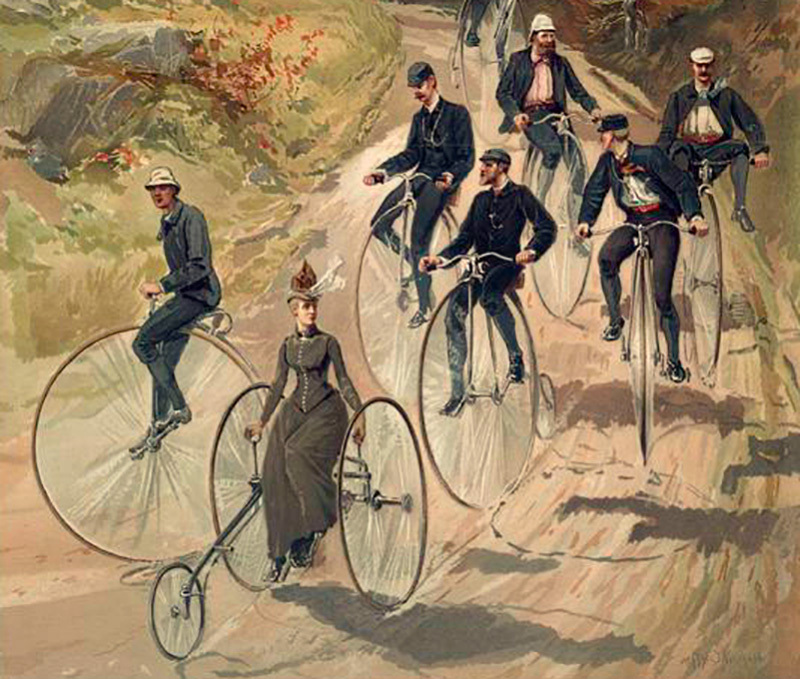 Woman on tricycle, followed by men on penny-farthings, c. 1887. Detail from a chromolithographic print of an aquarelle (water color) by Canadian artist Henry “Hy” Sandham (1842–1910). Printed by L. Prang & Co. (Boston). Click on image to see full painting. Image courtesy of The New York Public Library Digital Collections. 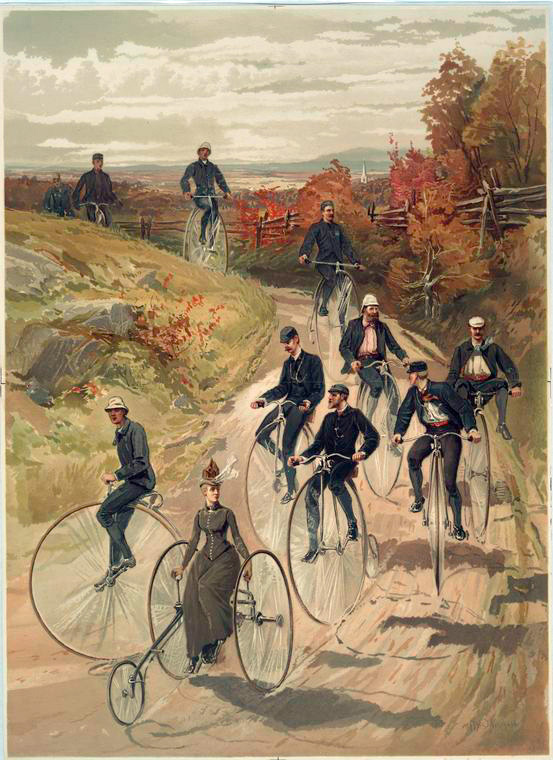 In the late 1870s and early 1880s the first of several bicycling crazes swept across America, and riding schools, cycling clubs, races, and tournaments were established in cities from Boston to San Francisco. The first bicycle models eventually became known as “high-wheels” or “Ordinaries” or (importing from England) “penny-farthings,” their front and back wheels reminding onlookers of a penny leading a farthing, but at the time everyone simply called them “bicycles.” The earliest contraptions, however, were famously hazardous—as 48-year-old Samuel Langhorne Clemens found out in May 1884, when he decided to learn how to ride one. I have been asked to tell, briefly, what bicycling is like, from the novice’s point of view. . . . It was on the 10th of May, of the present year, that a brace of curiously contrasted events added themselves to the sum of my experiences; for on that day I confessed to age by mounting spectacles for the first time, and in the same hour I renewed my youth, to outward appearance, by mounting a bicycle for the first time. The same year Clemens tried to ride a bicycle, he started up his own publishing firm. In June he wrote to his nephew-in-law and business manager Charles L. Webster with an update on a new sketch he had been struggling with: “I revised, & doctored, & worked at the bicycle article, but it was no use, I didn’t like it at all—so I tore it up.” He asked Webster to destroy the copy he’d sent him and indicated he would work on the idea some more during the following year. He ultimately abandoned it, but fortunately a manuscript and part of a typescript survived. Mark Twain’s literary executor Albert Bigelow Paine found the piece among Clemens’s papers and included it in the 1917 collection What Is Man? and Other Essays. Note: Pond’s Extract, a patent medicine made of witch hazel, was developed by Theron T. Pond in 1846. The company founded in 1849 to distribute the product is the forerunner of the beauty products company that still exists today. I thought the matter over, and concluded I could do it. So I went down and bought a barrel of Pond’s Extract and a bicycle. . . . If you don't see the full selection below, click here (PDF) or click here (Google Docs) to read it—free! 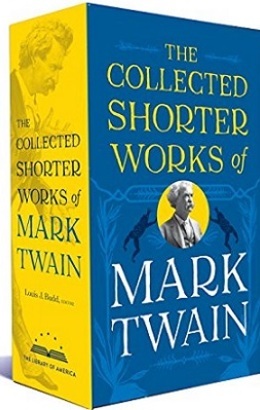 Wouldn't it be wonderful to write like Mark Twain? It can't be done. He's inimitable.